In its Death on the Job Report released on May 8, AFL-CIO reports that the Bureau of Labor Statistics ("BLS") numbers on workplace fatalities fail to account for the nearly 50,000 workers who die each year due to illnesses contracted while at work. The report attributes the undercounting to underreporting by employers and limitations in the injury reporting system. The undercounting is not insignificant. According to the AFL-CIO report, the true number of workplace fatalities and injuries for 2012 is between 7.6 Million and 14.4 Million, a number far greater than the 3.8 Million reported by BLS. According to Peg Seminario, AFL-CIO's Safety and Health Director, OSHA's proposed recordkeeping rules, which would improve tracking of injuries and illnesses, do not go far enough to correct the undercounting of illnesses and injuries. She suggests that OSHA could address this problem by including provisions to protect workers who report injuries and prohibiting employer practices that discourage reporting of illnesses and injuries. Additional enforcement can help. In 2012 OSHA conducted 351 inspections under its national emphasis program on reporting and recording injuries,and two thirds of those inspections yielded violations of OSHA's recordkeeping requirements. However, with less than 2,000 inspectors and over 8 million covered work sites, it is impossible for OSHA to catch all violations. Even when violators of recordkeeping rules are caught, the AFL-CIO report asserts that the penalties are too low to deter violations. The average federal penalty is $1,895 for federal violations and $1,011 for state violations. 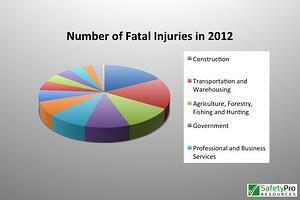 For fatality cases, the median federal penalty was only $5,600. Finalization of the proposed standard to reduce silica exposure, which they assert would prevent 700 deaths and 1,600 cases of silica-related disease each year. An increase of funding and staff at OSHA and MSHA to enhance oversight of worksites and timely and effective enforcement. Addressing the problem of injury underreporting and prohibiting employer practices that discourage the reporting of injuries. Addressing the serious safety and health problems and increased risk of fatalities and injuries faced by Latino and immigrant workers. Addressing the escalating fatalities and injuries in the oil and gas extraction industry through intensive and comprehensive intervention. Without action, they argue that the workplace fatality crisis in this industry will only get worse as production intensifies and expands.